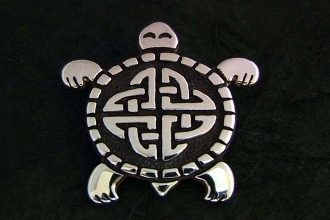 Our Products >> PROTECTION SYMBOLS >> Turtle "First Nations Celtic Turtle"
This combination of design elements draws from the protective qualities of turtles in Native American belief, alonside the "Irish Love Knot" (see description) which is also considered symbolic of protection against negative forces. Several First Nations cultures reffered to the North American Continent as "Turtle Island," and we all live on the backs of these graceful, life giving creatures. This item is a solid weight pendant, around the size of a quarter. This image appeals to men and women who share resonance with the indigenous cultures in their appreciation of animal totems. Turtles in particular are renowned for their logevity, and life associations in many cultures. Bringing the turtle image into the celtic sphere is more about artistic license than historical record The creation of celtic versions of these creatures is based on a personal and powerful attraction to turtles themselves, as well as turtle creation mythology and totemic symbolism worldwide. Turtle "First Nations Celtic Turtle"